Global cuisine is located in Dublin. Established in June 2016, we offer an Asian influenced buffet style restaurant, with a wide variety of dishes and live cooking stations. 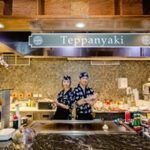 We provide over 100 different dishes from cuisines such as Japanese, Italian, Asian Influence and a live Teppenyaki Grill. We have a huge range of desserts, as well as two chocolate fountains. Children 3 years and below eat for FREE!! (Monday – Friday) Movie + Meal Deal €24 only! Eat as much as you like for one set price!